Photo: © Sven Gj. Gjeruldsen, Det kongelige hoff (The Royal Court). 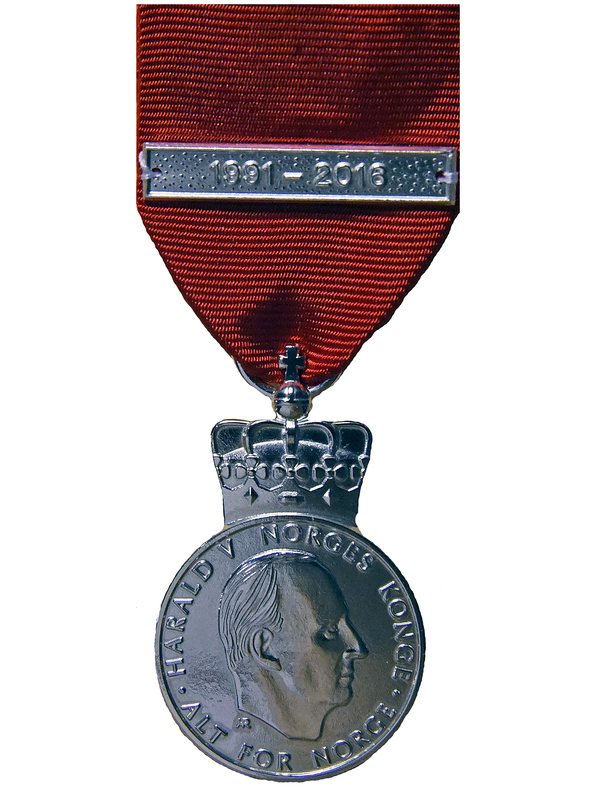 In order to commemorate King Harald V's 25th anniversary as King of Norway on 17 January 2016 His Majesty founded a new medal named King Harald Vs Jubilee Medal 1991–2016. In the order of precedence among the Norwegian decorations the new medal has been listed as no. 38. The list shows that also King Haakon VII and King Olav V founded similar medals on their 25th anniversary. The medal is in silver, 30 mm mounted closed crown. 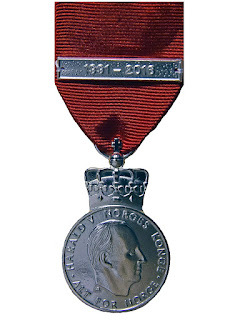 It is carried in a crimson ribbon with a sewn spangle of silver with the text «1991–2016». Obverse: Harald V's profile faced right encircled by the text «HARALD V NORGES KONGE ALT FOR NORGE» («HARALD V KING OF NORWAY ALL FOR NORWAY»). Reverse: King Harald V's crowned monogram H5. The medal has been engraved by Ingrid Austlid Rise and produced by Polath, Germany for Reide. Ingrid Austlid Rise is a goldsmith working for Det Norske Myntverket. Her biography can be found on Wikipedia (in Norwegian).